Affalterbach – Spectacular design, technology transfer from the world of motorsport and driving dynamics at the highest level; the new Mercedes-Benz C 63 AMG Coupé Black Series embodies the new AMG brand claim, Driving Performance, like no other AMG model. The new high-performance vehicle is the most powerful C-Class of all time, boasting a maximum output of 380 kW (517 hp) and a maximum torque of 620 newton metres. The AMG 6.3-litre V8 engine impresses with its hefty torque, tremendous pulling power and responsiveness, and ensures high-calibre performance: the C 63 AMG Coupé Black Series accelerates from zero to 100 km/h in 4.2 seconds (all data provisional). Exclusive fun at the wheel comes courtesy of the adjustable AMG coil-over sports suspension, the AMG high-performance compound braking system and the functional standard equipment. The AMG Track Package is available as an option to enhance driving dynamics even further. It boasts sports tyres and active rear-axle transmission cooling, plus the AMG Aerodynamics package including flics, a functionally tuned front splitter and an adjustable carbon-fibre rear aerofoil. Broad, low, brawny and ready to pounce from a standstill – the C 63 AMG Coupé Black Series makes a mighty impression. It’s clear right from the first time you set eyes on it that the C 63 AMG Coupé Black Series is made for ambitious laps on a closed-off race track. In visual terms the new high-performance vehicle is reminiscent of the SLS AMG GT3 customer sports car and symbolises the transfer of technology from the sphere of motorsport, which has been part of the corporate philosophy of Mercedes-AMG GmbH for 44 years now. With its new C 63 AMG Coupé Black Series, AMG is presenting an exciting sports car for enthusiasts who are passionate about sports cars which are big on horsepower, and this marks the impressive continuation of the Black Series strategy, which began back in 2006. AMG, the performance brand of Mercedes-Benz Cars, is once again demonstrating its expertise when it comes to designing and developing emotionally appealing high-performance cars. “AMG has its roots in international motorsport. The new C 63 AMG Coupé Black Series is the best proof there is for the permanent transfer of technology from the race track to the road. The numerous successes in the DTM, the customer sports range featuring the SLS AMG GT3 and our commitment to Formula 1, where we have been providing the Official F1Ô Safety Car and the Official F1 Ô Medical Car for the past 15 years, continuously spur on our engineers and technicians. The C 63 AMG Coupé Black Series embodies the new AMG brand claim, Driving Performance, like no other AMG model”, comments Ola Källenius, the CEO of Mercedes-AMG GmbH. It doesn’t matter from which angle you’re looking at it: the new C 63 AMG Coupé Black Series displays its ties with motorsport from every perspective. The arrow-shaped front section with the central Mercedes star in the radiator grille is the visual synonym for its unfettered forwards thrust. The air intakes in the striking front apron ensure reliable air flow through the large cooling modules. Two openings in the aluminium bonnet support the expelling of engine heat, whilst the struts positioned at an angle in the front apron emphasise the vehicle’s width. The black front splitter located at the lower end helps to balance the vehicle aerodynamically. The expressive design continues in the side view: the newly developed front axle with a greater track width calls for new wings, which have been widened by 28 millimetres on each side. “6.3” logos give a nod to the sheer power of the large-displacement eight-cylinder high-speed naturally aspirated engine beneath the bonnet. Air outlets intimated behind the wheel cut-outs call to mind powerful racing cars. The onlooker discovers a black strip on the restyled AMG side skirts – a look which continues the idea of the front splitter. On each side the rear wings have also been widened by 42 millimetres, due to the greater track width of the rear axle. Air openings are hinted at in front of the rear wheels, forming a fitting conclusion. 255/35 R 19 and 285/30 R 19 – these are the impressive wheel formats for the C 63 AMG Coupé Black Series at its market launch. The wheel/tyre combination is mounted on 9 x 19 (front) and 9.5 x 19 (rear) AMG light-alloy wheels, fills out the wings to stunning effect and plays a significant part in the dynamic appearance of this new AMG sports car. Painted titanium grey, the high-sheen light-alloy wheels are produced using particularly light forging technology – as is the case on the SLS AMG. These forged wheels weigh a total of eleven kilograms less than comparable wheels with a conventional design. The lower weight results in reduced unsprung masses, which improves both the suspension’s response and the steering precision. The tail end of the Black Series coupé is also a feast for the eyes: the new rear apron with its expressive black diffuser insert creates a broad effect. Just like on the SLS AMG GT3, it protrudes beyond the profile of the rear apron. The black grille on the upper end of the diffuser insert is an eye-catching feature, as is the AMG sports exhaust system: both of the chromed twin tailpipes integrated into the rear apron have an angular cross-section. The spoiler lip on the boot lid is painted in the vehicle colour and reduces lift at the rear axle, resulting in more driving stability at high speeds. The AMG logo with its discreet “Black Series” lettering is reserved exclusively for the C 63 AMG Coupé Black Series. A displacement of 6.3 litres, a maximum output of 380 kW (517 hp) and a torque of 620 newton metres from eight cylinders – one glance at the technical data and it’s clear that the engineering behind the C 63 AMG Coupé Black Series is every bit the equal of its sensational appearance. The high-torque M156 naturally aspirated engine was specially refined for the new two-door model, whose forged pistons, connecting rods and the crankshaft with a lightweight design, for example, all come courtesy of the SLS AMG. These measures are flanked by a new engine control unit. As the car’s performance proves, the uprated V8 engine has an easy time of it in the coupé: the sprint from standing to 100 is over in 4.2* seconds (* preliminary data). Plenty of pulling power, an agile response and hefty torque – the qualities of the large-displacement AMG high-speed naturally aspirated engine arouse unadulterated passion in the driver. The jewel in the crown is the emotive, hallmark AMG eight-cylinder sound from the AMG sports exhaust system. The optimised engine oil cooling ensures more performance even when the vehicle is put through its paces in harsh race-track conditions. With the aid of components from the SLS AMG, the AMG experts have managed to give the oil cooler a cooling surface which is 50 percent larger. The tried-and-trusted, innovative AMG SPEEDSHIFT MCT 7-speed sports transmission takes care of power transmission. Four transmission modes, the double-declutching function and RACE START promise maximum motoring pleasure and a high degree of variability. In the “Sport plus” and “Manual” transmission modes the gear changes take a mere 100 milliseconds. The AMG sports suspension is a sophisticated new development. It has been designed as a coil-over suspension, as is the norm in motorsport – and it represents a hallmark feature of a Black Series model. It offers numerous setting options, and allows the driver to create their own personal set-up. The track width of the axles has been widened by 40 (at the front) and 79 millimetres (at the rear) respectively. In conjunction with the modified torsion-bar stabilisers, the C 63 AMG Black Series impresses with its pronounced driving dynamics, high grip and low roll angle. The AMG speed-sensitive sports steering facilitates superb vehicle control: the retuned map control for the power assistance ensures optimum steering precision. The standard-specification AMG rear axle differential lock is responsible for reliable traction in particular for race-track applications. The 3-stage ESP® offers the ideal solution for all driving situations: via the ESP® button the driver can choose from the “ESP ON”, “Sport Handling Mode” and “ESP OFF” stages. In view of the increased driving dynamics, not only has the anti-lock braking system been completely retuned; the AMG high-performance braking system has also been redeveloped: a larger braking system is now used, with discs featuring compound technology proven in motorsport at the front axle (format: 390 x 36 millimetres) and integral discs at the rear axle (360 x 26 mm). Red-painted six-piston fixed callipers at the front and four-piston fixed callipers at the rear reliably decelerate the perforated, fade-resistant brake discs, which are ventilated all round. The captivating high-tech components and the spectacular exterior design both find their logical continuation in the interior of the C 63 AMG Coupé Black Series, which is black with red highlight elements, displaying the functional atmosphere of a true racing vehicle, whilst at the same time positively glowing with high quality and lovingly crafted details. Two AMG sports bucket seats facilitate the best levels of lateral support and thus optimum vehicle control on the race track. The black DINAMICA microfibre upholstery on the centre panels of the seats and doors is a new type of synthetic fibre which is characterised by its high lightfastness. The omission of the rear bench seat underlines the vehicle’s sporty character and reduces its weight. As an option the C 63 AMG Coupé Black Series is also available as a four-seater including the AMG sports seats familiar from the C 63 AMG Coupé – and with single seats in the rear. The AMG performance steering wheel in nappa leather/DINAMICA microfibre with a steering wheel rim featuring flattened top and bottom sections has aluminium shift paddles for manual gear changes. Red seat belts and red contrasting topstitching on the steering wheel, on the seats, door centre panels, armrests on the doors, the centre console and on the shift lever gaiter add some interesting highlights. An exclusive “Black Series” logo adorns the trim on the dashboard, which sports a high-gloss black piano-lacquer look. The dashboard with three autonomous round dials has a three-dimensional TFT colour display. On opening the vehicle door the driver is greeted by AMG lettering. Possible displays for the engine oil temperature, the ESP® mode or the gear selection are integrated into the AMG main menu. The rotary switch for the C, S, S+ and M transmission modes and RACE START is located on the centre console next to the selector lever with a DINAMICA microfibre cover. The C 63 AMG Coupé Black Series is proof positive that high driving dynamics and excellent active and passive safety need not necessarily be mutually exclusive: five airbags, belt tensioners and belt-force limiters for all seats are part of the standard specification, as are the anti-lock braking system ABS, the 3-stage ESP®, Headlamp Assist, the tyre pressure loss warning system and cruise control with SPEEDTRONIC variable speed limiter. AMG has two special packages to offer for enhancing driving dynamics even further: the AMG Track Package comprises 255/35 R 19 front and 285/30 R 19 rear sports tyres from Dunlop. They have been exclusively developed for the C 63 AMG Coupé Black Series, and they tangibly and measurably increase grip. Active rear-axle transmission cooling improves performance in punishing race-track conditions. The radiator is located in the rear apron and the airflow passes through it effectively. What are known as flics are part of the AMG Aerodynamics package. They are made of genuine carbon fibre and located on the front apron. Also included in the package are a functionally tuned front splitter made of genuine carbon fibre and a fixed carbon-fibre rear aerofoil with an adjustable blade. Both components not only increase the lift at the front and rear axle; they also optimise the vehicle’s aerodynamic balance. Whilst its driving dynamics are totally suited to the race track, the new C 63 AMG Coupé Black Series offers all the properties which characterise a true Mercedes-Benz: suitability for everyday use, durability, safety and quality. The most powerful C-Class of all time is the fourth Black Series model to be launched since 2006. The first one was the SLK 55 AMG Black Series. The AMG 5.5-litre V8 engine in the decidedly puristic two-seater enticed customers with its maximum output of 294 kW (400 hp) and a torque of 520 newton metres, and between July 2006 and April 2007 120 units were produced. 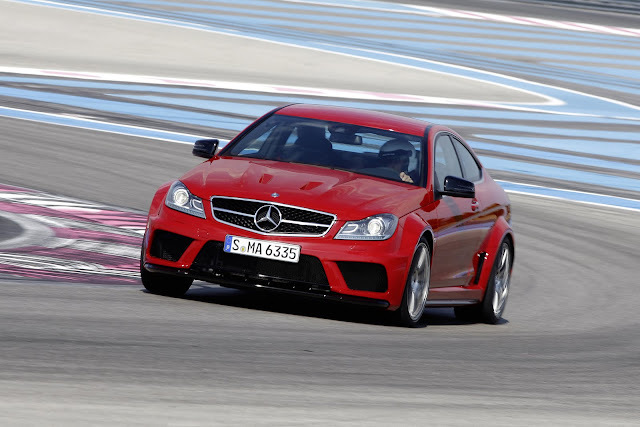 The CLK 63 AMG Black Series followed directly in its footsteps. The two-seater coupé was powered by an AMG 6.3-litre V8 engine with 373 kW (507 hp) and a torque of 630 newton metres. Between April 2007 and March 2008 700 vehicles were made. The highlight up until now was the SL 65 AMG Black Series, which was unveiled in July 2008: the high-performance coupé still captivates drivers today with its spectacular appearance, unique performance data, systematic lightweight construction and exclusivity of the highest calibre. The AMG 6.0 litre V12 biturbo engine with a maximum output of 493 kW (670 hp) and torque of 1000 newton metres made the SL 65 AMG Black Series the most powerful AMG vehicle ever to enter series production. 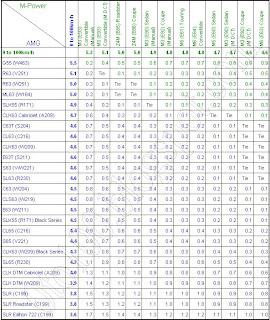 In total there were 350 units built from September 2008 to August 2009. The C 63 AMG Coupé Black Series is celebrating its world premiere during the Formula 1 race on the Nürburgring, the German Grand Prix (23 – 24 July 2011). The market launch will follow in January 2012, and its sales price is 115,430 euros (incl. 19% VAT).